Raise your character to the pinnacle of magical might with Pathfinder RPG Ultimate Magic. Within this book, secrets arcane and divine lie ready to burst into life at the hands of all the spellcasting classes in the Pathfinder Roleplaying Game. In addition to the brand-new magus class - a master of both arcane magic and martial prowess - you'll also find a whole new system for spellcasting, rules for spell duels and other magical specialities, and pages upon pages of new spells, feats, and more. Because when it comes to magic, why settle for less than absolute power? 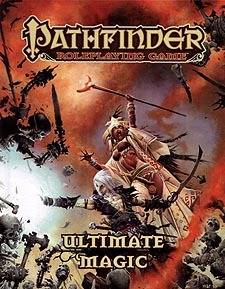 Pathfinder RPG Ultimate Magic is a must-have companion volume to the Pathfinder RPG Core Rulebook. This imaginative tabletop game builds on more than 10 years of system development and an Open Playtest featuring more than 50,000 gamers to create a cutting-edge RPG experience that brings the all-time best-selling set of fantasy rules into the new millennium. The magus, a new base class combining deadly arcane magic with the skills and weapons of a trained warrior. Words of power, an innovative and flexible new spellcasting system. New options for dedicated casters, such as alchemist discoveries, alternative uses for channelled energy, druid companions, sorcerer bloodlines, eidolon abilities, witch hexes, and oracle mysteries. Additional feats and magical abilities for martially oriented casters, including monk ki tricks, inquisitor archetypres, and ranger traps. New magical conditions called spellblights, as well as systems for crafting constructs, binding outsiders, and spell-dueling. More than 100 new spells, plus detailed guidelines for designing your own.